What is Captioning and Court Reporting? It’s the ability to listen to the spoken word and accurately transcribe it into digital text. If you like to text and talk, this career is for you. Tri-C’s Captioning and Court Reporting program offers one of the most recognized and sought after two-year degree programs in the country. It allows students to choose a learning path that fits their lifestyle -- online, campus or a combination of the two. Currently, it is one of the most in-demand professions in the country. In courtrooms, boardrooms, conference rooms, classrooms, sport complexes and other venues, there is a growing need. Program graduates typically have a job waiting for them with average starting salaries around $45,000 and the potential to earn more than $100,000 annually. Both steno and voice writers have the ability to maintain flexible work schedules, enabling them to fulfill family responsibilities and personal endeavors while pursuing exciting, lucrative careers. You can even work from home. This is exciting news to those of you who are attentive, focused, and driven! Love to text? Steno Writing is the track for you. Turn your typing and texting skills into a fantastic career. Steno writing is the term used to describe depressing the stenotype machine keys simultaneously to capture and transcribe the words of the speakers. 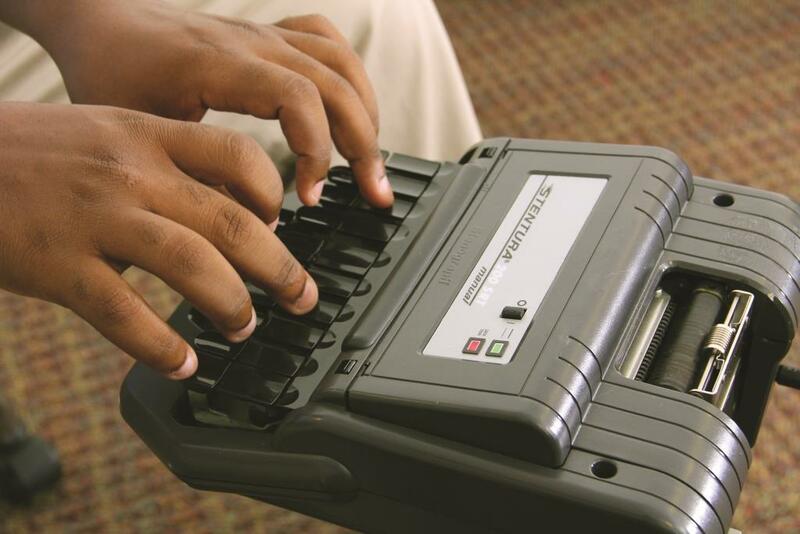 Steno Machine Scholarship: A two-year steno machine scholarship opportunity is available for students enrolled in campus Realtime Theory and Speedbuilding classes. Apply for the scholarship! Love to talk? Voice Writing is the track for you. Turn your talking and listening skills into a great paying career. Voice Technology uses speech recognition equipment and specialized software to translate speech into text.